UNAIR NEWS – As the mandate contained in the fifth principle of Pancasila, the Government of Indonesian Republic continues to pursue equitable social justice throughout the country. To provide insight to students, Universitas Airlangga through Faculty of Economics and Business (FEB) held a public lecture entitled “Fair Energy for People’s Welfare, Economic Growth and Sustainable Investment” on Thursday, April 12. The lecture delivered directly by Minister of Energy and Mineral Resources (ESDM) of Indonesia Republic Ignasius Jonan was attended by UNAIR officials, FEB UNAIR professors, lecturers, Alumni Association of Faculty of Economics and Business (IKAFE), and thousands of UNAIR students from S1, S2, and S3 studies. Participants were divided into two rooms namely Fadjar Notonagoro Hall and Supoyo Hall FEB UNAIR. It was started with the National Anthem of Indonesia, Indonesia Raya and Hymne Airlangga and moderated by Dr. Rudi Purwono, SE, M.SE. , which makes the public lecture more interesting. On that occasion, Minister of ESDM RI who is also alumni of FEB UNAIR explained about his programs so far. He also revealed the sectors that are the responsibility of the Ministry of ESDM. “So I deal with oil and gas, electricity, mineral and coal mining, energy conservation, and geological bodies,” he explained. In addition, the minister who is familiarly called Jonan explained about the contribution of ESDM. Currently, he added, the ESDM sector is ranked third for the largest after the Ministry of Public Welfare and Agriculture, Forestry and Fisheries. According to him, the total contribution of the ESDM sector to Gross Domestic Product (GDP) is 11.77 percent. “For the 11.77 percent of the national economy, I am responsible as the regulator to grow better,” said Accounting alumnus of UNAIR. In addition, he also explained about the capital development and fair energy, such as One Price Fuel (BBM) and Fuel Kit Converter to LPG. One Price Fuel Program was intended for all the people of Indonesia so fuel prices in all regions are the same and Fuel Kit Converter to LPG program was intended for traditional fishermen. 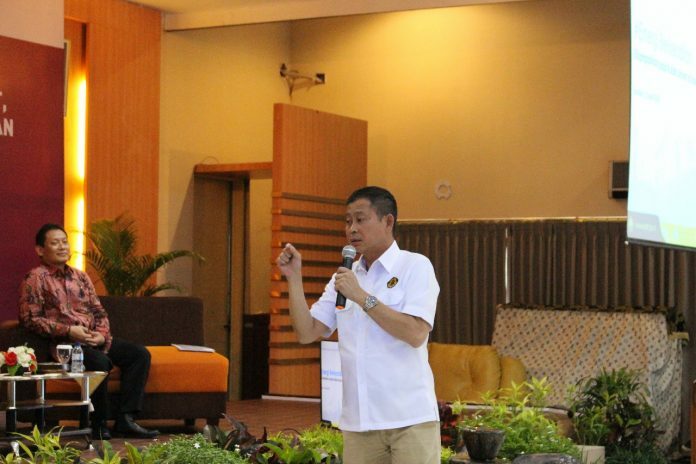 “This converter program can reduce the operational cost of fishermen around Rp 30,000 – 50,000 / day,” he said. Jonan added that there is also Development of Municipal Gas Network (JARGAS) in areas that have gas potential. There is also Oil and Gas Lifting (MIGAS) which is currently being managed, such as the Mahakam Block. Other programs, added Jonan is Renewable Energy, Solar Energy Saving Lamp, and Electrification Ratio Increase for electricity distributed evenly in Indonesia. “The areas with low electrification level are West Nusa Tenggara and Papua, and we are currently pursuing the region to be equivalent to other regions,” he added. In addition to these programs, he added, ESDM also handles geological sectors and issues disaster events recapitulation.